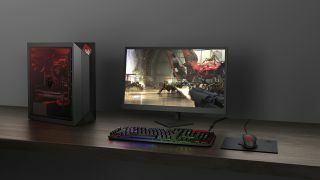 The HP Omen Obelisk might look like just another pre-built gaming desktop, but it’s been designed from the ground up for PC builders. From support for multiple full-length graphics cards to standard Micro-ATX motherboards and power supplies, the HP Omen Obelisk is one of the most easily upgradable pre-built gaming PCs we’ve seen since the Lenovo Legion Y920 Tower. The Obelisk is one of HP’s most functional chassis designs yet, with extensive venting around all its sides. It also packs front-facing ports, magnetic dust covers and, of course, customizable RGB lighting for the front logo and optional tempered glass side panel. Better yet, HP plans to let users configure their system however they want with both Intel Coffee Lake and AMD Ryzen 2nd Generation CPU options. The electronics firm has also partnered up with Hyper X to provide its pre-built systems with up to 32GB of DDR4-2666MHz memory. Unfortunately, the Obelisk doesn’t feature any of HP’s usual hot swappable storage bays, but this PC includes room for two 3.5-inch drives (adaptable for 2.5-inch drives) and one m.2 storage devices. Lastly, you’ll find an Integrated mounting area for an 120mm fan or liquid-cooled radiator at the top of the case. Available later this September, HP Omen Obelisk models start at $849 (about £660, AU$1,540) with configurations that include an Intel Core i3-8100, Nvidia GTX 1050, 8GB of RAM and 1TB hard drive. Meanwhile, the top-end model kicks things up with an Intel Core i7-8700, Nvidia GeForce GTX 1070, double the RAM and an additional 256GB NVMe SSD for $1,549 (about £1,220, AU$2,120). HP also plans to add the Nvidia GeForce RTX 2080 to its stack of configuration options, making it one of the first systems in the world to carry the Nvidia GeForce RTX 20 Series of GPUs. HP has also announced a $199 (around £150, AU$280) price for its actively-cooled Mindframe gaming headset first announced in May. Scheduled to arrive in early October, the HP Mindframe headset utilizes a thermoelectric device to conduct heat away from the inside of the ear cup in a similar fashion to refrigerators and air conditioners.